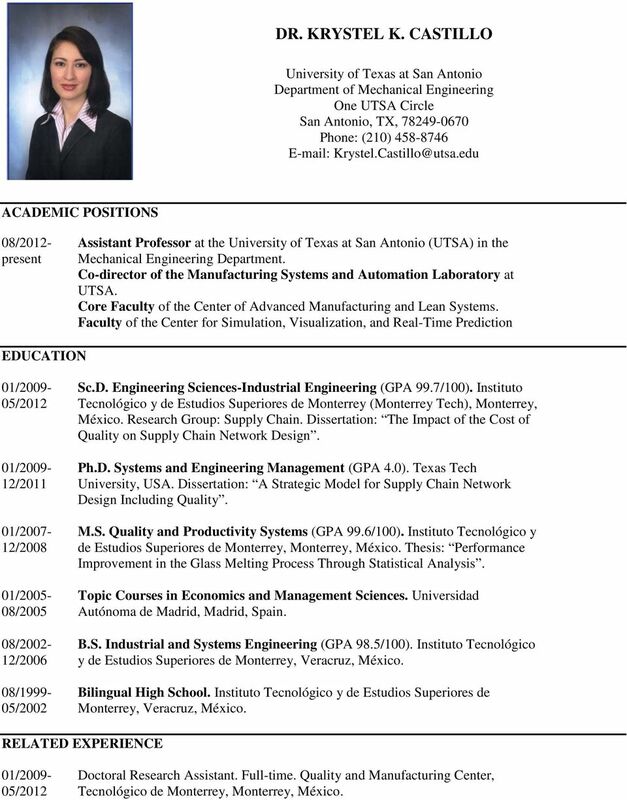 Download "DR. KRYSTEL K. CASTILLO"
1 DR. KRYSTEL K. CASTILLO University of Texas at San Antonio Department of Mechanical Engineering One UTSA Circle San Antonio, TX, Phone: (210) ACADEMIC POSITIONS 08/2012- present Assistant Professor at the University of Texas at San Antonio (UTSA) in the Mechanical Engineering Department. Co-director of the Manufacturing Systems and Automation Laboratory at UTSA. Core Faculty of the Center of Advanced Manufacturing and Lean Systems. Faculty of the Center for Simulation, Visualization, and Real-Time Prediction EDUCATION 01/ / / / / / / / / / / /2002 Sc.D. Engineering Sciences-Industrial Engineering (GPA 99.7/100). Instituto Tecnológico y de Estudios Superiores de Monterrey (Monterrey Tech), Monterrey, México. Research Group: Supply Chain. Dissertation: The Impact of the Cost of Quality on Supply Chain Network Design. Ph.D. Systems and Engineering Management (GPA 4.0). Texas Tech University, USA. Dissertation: A Strategic Model for Supply Chain Network Design Including Quality. M.S. Quality and Productivity Systems (GPA 99.6/100). Instituto Tecnológico y de Estudios Superiores de Monterrey, Monterrey, México. Thesis: Performance Improvement in the Glass Melting Process Through Statistical Analysis. Topic Courses in Economics and Management Sciences. Universidad Autónoma de Madrid, Madrid, Spain. B.S. Industrial and Systems Engineering (GPA 98.5/100). Instituto Tecnológico y de Estudios Superiores de Monterrey, Veracruz, México. Bilingual High School. Instituto Tecnológico y de Estudios Superiores de Monterrey, Veracruz, México. RELATED EXPERIENCE 01/ /2012 Doctoral Research Assistant. Full-time. Quality and Manufacturing Center, Tecnológico de Monterrey, Monterrey, México. 3 Book Castillo-Villar, Krystel K. (2012). Supply Chain Network Design Including Cost of Quality: A Strategic model and metaheuristics. Germany: Lambert Academic Publishing. ISBN: , pp Book Chapter Castillo-Villar, Krystel K. and Smith, N. R. (2013). Supply Chain Design including Quality Considerations: Modeling and Solution Approaches based on Metaheuristics. Book Chapter in Soft Computing Intelligent Algorithms in Engineering, Management, and Technology, Editor: P. Vasant. USA: IGI Global, (Accepted), In Press, Expected date of publication: August Refereed conference proceedings (presenter underlined) Sadia Quader, Castillo-Villar K., (2013). A State-of-the-Art Matrix Analysis of Bucket Brigade. Paper presented at the Industrial and Systems Engineering Research Conference 2013, Institute of Industrial Engineers, San Juan, Puerto Rico, May 18-22, Castillo-Villar, K. K., Smith, N. R., & Simonton, J. L. (2011). Enhancing performance through statistical analysis: a case study in the glass industry. Paper presented at the 32 nd Annual National Conference of the American Society for Engineering Management, Lubbock, Texas, USA, October 19-22, 2011, CD- ROM. Castillo-Villar, K. K., Smith, N. R., & Simonton, J. L. (2010). Cost of Quality in supply chain design: A preliminary study. Paper presented at the 31 st Annual National Conference of the American Society for Engineering Management, Rogers, Arkansas, USA, October 13-16, 2010, CD-ROM. Castillo-Villar, K. K., Smith, N. R., & Simonton, J. L. (2010). Toward Integrating Cost of Quality in Supply Chain Network Modeling. Paper presented at the Industrial Engineering Research Conference, Institute of Industrial Engineers, Cancun, Q.R., México, June 5-9, Castillo-Villar, K. K., & Simonton, J. L. (2009). Cost of Quality: Interdisciplinary Cooperation Between Accounting and Quality Function. Paper presented at the 30 th Annual Conference of the American Society for Engineering Management, Springfield, MO, USA, October 14-17, 2009, CD-ROM. Castillo-Villar, K. K., Simonton, J. L., & Smith, N. R. (2009). Performance Improvement in the Glass Melting Process Through Statistical Analysis. Paper presented at the 30 th Annual Conference of the American Society for Engineering Management, Springfield, MO, USA, October 14-17, 2009, CD-ROM. 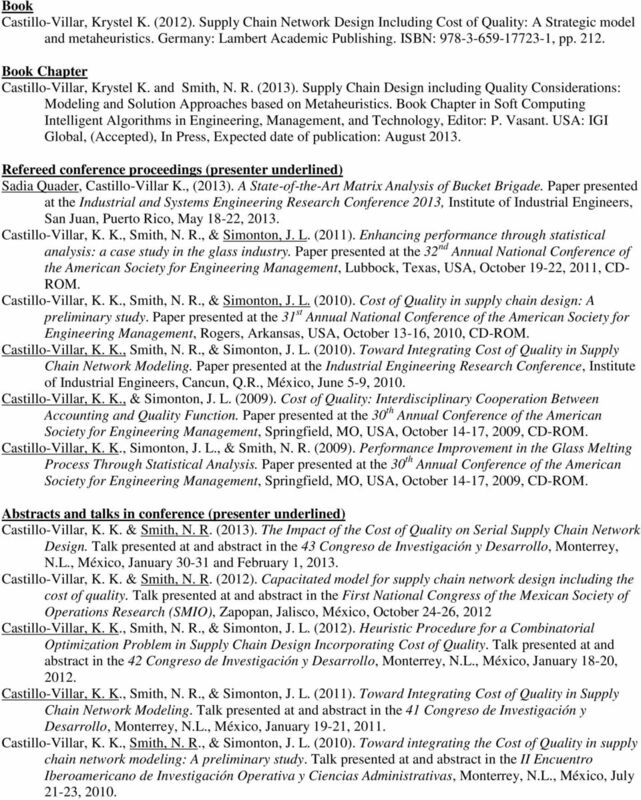 Abstracts and talks in conference (presenter underlined) Castillo-Villar, K. K. & Smith, N. R. (2013). The Impact of the Cost of Quality on Serial Supply Chain Network Design. Talk presented at and abstract in the 43 Congreso de Investigación y Desarrollo, Monterrey, N.L., México, January and February 1, Castillo-Villar, K. K. & Smith, N. R. (2012). Capacitated model for supply chain network design including the cost of quality. Talk presented at and abstract in the First National Congress of the Mexican Society of Operations Research (SMIO), Zapopan, Jalisco, México, October 24-26, 2012 Castillo-Villar, K. K., Smith, N. R., & Simonton, J. L. (2012). Heuristic Procedure for a Combinatorial Optimization Problem in Supply Chain Design Incorporating Cost of Quality. Talk presented at and abstract in the 42 Congreso de Investigación y Desarrollo, Monterrey, N.L., México, January 18-20, Castillo-Villar, K. K., Smith, N. R., & Simonton, J. L. (2011). Toward Integrating Cost of Quality in Supply Chain Network Modeling. Talk presented at and abstract in the 41 Congreso de Investigación y Desarrollo, Monterrey, N.L., México, January 19-21, Castillo-Villar, K. K., Smith, N. R., & Simonton, J. L. (2010). Toward integrating the Cost of Quality in supply chain network modeling: A preliminary study. Talk presented at and abstract in the II Encuentro Iberoamericano de Investigación Operativa y Ciencias Administrativas, Monterrey, N.L., México, July 21-23, 2010. 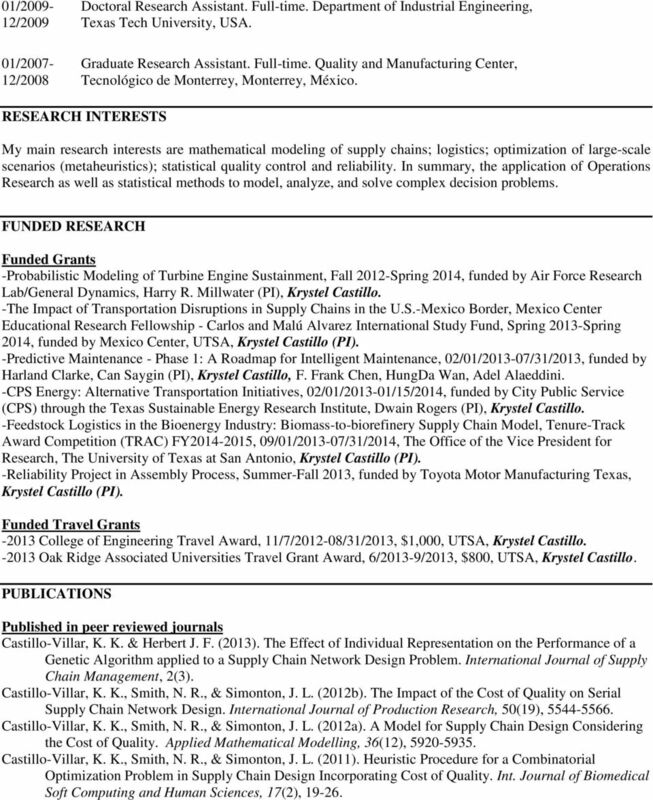 4 Invited talks (presenter underlined) Castillo-Villar, K. K., (2013). Supply Chain Network Design Including Quality-related Issues: Models and Solution Procedures. Talk presented at the Operations Research and Industrial Engineering Graduate Seminar, Department of Mechanical Engineering, The University of Texas at Austin, Austin, TX, February 15, Castillo-Villar, K. K., (2012). Enhancing Performance through Statistical Techniques: A Case Study in the Glass Container Industry. Talk presented at the Management Science and Statistics Seminar, College of Business, The University of Texas at San Antonio, San Antonio, TX, November 2, Castillo-Villar, K. K., (2012). Enhancing Performance through Statistical Techniques: A Case Study in the Glass Container Industry. Talk presented at the Continuous Improvement Meeting, The University of Texas at San Antonio, San Antonio, TX, October 5, Castillo-Villar, K. K., (2012). The impact of the Cost of Quality on supply chain design. Talk presented at the Engineering Management and Systems Engineering Graduate Seminar, Department of Engineering Management and Systems Engineering, Missouri University of Science and Technology, Rolla, MO, March 12, Castillo-Villar, K. K. and Smith, Neale R., (2011). Supply Chain Design including the Cost of Quality (Diseño de cadena de suministro tomando en cuenta el costo de calidad). Talk presented at the Graduate Program in Economics Research Seminar, Universidad Autonoma de Nuevo Leon, Monterrey, Mexico, October 25, Castillo-Villar, K. K., (2011). A strategic model for serial supply chain design integrating the Cost of Quality. Talk presented at the Supply Chain Research Group Seminar, Quality and Manufacturing Center, Monterrey Tech, Mexico, October 11, Castillo-Villar, K. K., (2008). Response Surface Analysis applied to a glass making process. Talk presented at the Applied Statistics Seminar from the MS in Applied Statistics, Monterrey Tech, Mexico, October, TEACHING Applied Engineering Analysis, EGR 2323, Undergraduate, 88 students, Fall Advanced Quality Control, EGR 5233/4953, Senior Elective/Graduate, 15 students, Spring Applied Engineering Analysis, EGR 2323, Undergraduate, 82 students, Fall MINORITY STUDENT RECRUITMENT AND MENTORING Active recruitment and mentoring of minority students is an important component of teaching and education. With an increasing percentage of the US population of minority background, it is important to encourage, recruit and mentor minority students. As a result, I have made it a priority to recruit and develop minority students. 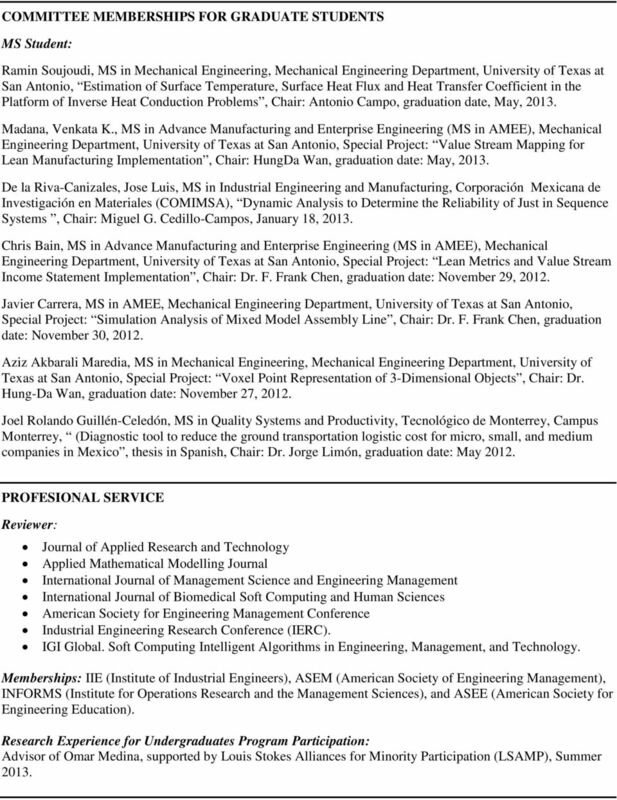 Hernan Chavez (Hispanic), PhD, Mechanical Engineering with concentration in Manufacturing Systems, UTSA. Topic: Simulation of distribution networks. In progress. Sadia Quader (Female), MS-Advanced Manufacturing Enterprise Engineering, UTSA. Topic: Order-picking algorithms for warehousing optimization. Expected Graduation: December Roberto Cubillan (Hispanic), MS-Advanced Manufacturing Enterprise Engineering, Special Project, UTSA. Jessica Chong-Macias (Female Hispanic), Undergraduate: Junior, Mechanical Engineering, UTSA. Topic: Inventory Modeling and Management. Omar Medina (Hispanic), Undergraduate: Sophomore, supported by Louis Stokes Alliances for Minority Participation (LSAMP), Summer 2013. 5 COMMITTEE MEMBERSHIPS FOR GRADUATE STUDENTS MS Student: Ramin Soujoudi, MS in Mechanical Engineering, Mechanical Engineering Department, University of Texas at San Antonio, Estimation of Surface Temperature, Surface Heat Flux and Heat Transfer Coefficient in the Platform of Inverse Heat Conduction Problems, Chair: Antonio Campo, graduation date, May, Madana, Venkata K., MS in Advance Manufacturing and Enterprise Engineering (MS in AMEE), Mechanical Engineering Department, University of Texas at San Antonio, Special Project: Value Stream Mapping for Lean Manufacturing Implementation, Chair: HungDa Wan, graduation date: May, De la Riva-Canizales, Jose Luis, MS in Industrial Engineering and Manufacturing, Corporación Mexicana de Investigación en Materiales (COMIMSA), Dynamic Analysis to Determine the Reliability of Just in Sequence Systems, Chair: Miguel G. Cedillo-Campos, January 18, Chris Bain, MS in Advance Manufacturing and Enterprise Engineering (MS in AMEE), Mechanical Engineering Department, University of Texas at San Antonio, Special Project: Lean Metrics and Value Stream Income Statement Implementation, Chair: Dr. F. Frank Chen, graduation date: November 29, Javier Carrera, MS in AMEE, Mechanical Engineering Department, University of Texas at San Antonio, Special Project: Simulation Analysis of Mixed Model Assembly Line, Chair: Dr. F. Frank Chen, graduation date: November 30, Aziz Akbarali Maredia, MS in Mechanical Engineering, Mechanical Engineering Department, University of Texas at San Antonio, Special Project: Voxel Point Representation of 3-Dimensional Objects, Chair: Dr. Hung-Da Wan, graduation date: November 27, Joel Rolando Guillén-Celedón, MS in Quality Systems and Productivity, Tecnológico de Monterrey, Campus Monterrey, (Diagnostic tool to reduce the ground transportation logistic cost for micro, small, and medium companies in Mexico, thesis in Spanish, Chair: Dr. Jorge Limón, graduation date: May PROFESIONAL SERVICE Reviewer: Journal of Applied Research and Technology Applied Mathematical Modelling Journal International Journal of Management Science and Engineering Management International Journal of Biomedical Soft Computing and Human Sciences American Society for Engineering Management Conference Industrial Engineering Research Conference (IERC). IGI Global. Soft Computing Intelligent Algorithms in Engineering, Management, and Technology. Memberships: IIE (Institute of Industrial Engineers), ASEM (American Society of Engineering Management), INFORMS (Institute for Operations Research and the Management Sciences), and ASEE (American Society for Engineering Education). Research Experience for Undergraduates Program Participation: Advisor of Omar Medina, supported by Louis Stokes Alliances for Minority Participation (LSAMP), Summer 2013. 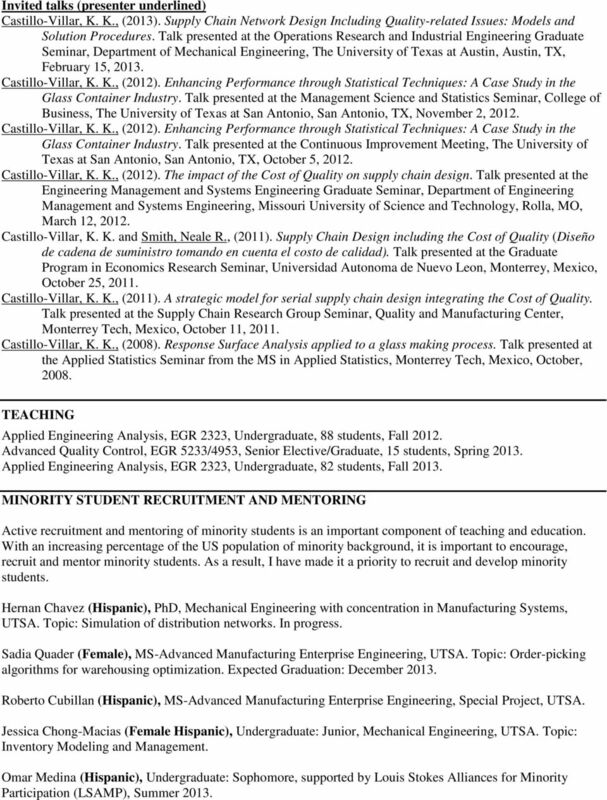 6 Advisor of Jessica Chong-Macias supported by SiViRT (Center for Simulation, Visualization, and Real Time Prediction), UTSA, Spring Advisor of two undergraduate students: Guillermo Teyechea-Marquez and Roger D. Escobedo-Arzapalo) who participated in a Research Experience for Undergraduates Program (funded by CONACyT) during the summers 2010 and Scientific Committees Co-Chair in the 2014 ASME International Conference on Manufacturing Science & Engineering (MSEC2014), Quality & Reliability Symposium, June 9-13, 2014, MI, USA. 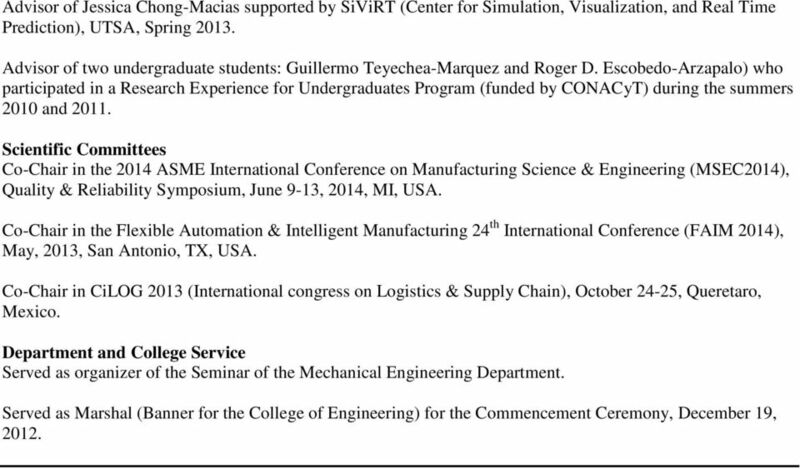 Co-Chair in the Flexible Automation & Intelligent Manufacturing 24 th International Conference (FAIM 2014), May, 2013, San Antonio, TX, USA. Co-Chair in CiLOG 2013 (International congress on Logistics & Supply Chain), October 24-25, Queretaro, Mexico. Department and College Service Served as organizer of the Seminar of the Mechanical Engineering Department. Served as Marshal (Banner for the College of Engineering) for the Commencement Ceremony, December 19, 2012. Master in Science, specialty in Information Systems. ITESM. México, June 1984. BHARATENDU SRIVASTAVA Department of Management College of Business Administration Marquette University P.O. Box 1881, Milwaukee, WI 53201-1881 (414) 288-3408 bharat.srivastava@marquette.edu EDUCATION Ph. Marian Manciu Physics Department, University of Texas at El Paso Dr. J. Lopez, Dr. F. Manciu, Dr. T. Vulcan University of Texas at El Paso Dr. R Waggener, Dr. A. Gutierrez, Dr. N. Papanikolaou, Dr. G.
Curriculum Vitae of ANTONIO ARREOLA RISA. B.S. in Industrial and Systems Engineering, Monterrey Institute of Technology, México, 1977. CANAN ULU. Operations and Information Management Area, http://explore.georgetown.edu/people/cu50/ Washington, D.C. 20057. Gail Malone VITAE. M.A. (English, minor in reading), Texas Tech University, May 1979. VITAE. Bachelor of Science, Industrial Engineering May 1985 Pennsylvania State University State College, Pennsylvania 3.21/4.